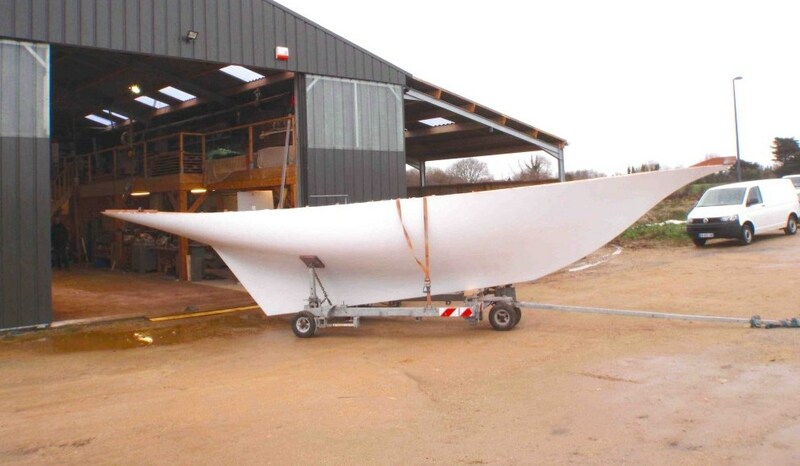 A brief glimpse of daylight for the new Hubert Stagnol built Watson – minus lead keel. In the past week, during a yard movement in Brittany, we were treated to a brief glimpse of Hubert Stagnol’s latest reincarnation – a “Super Seabird” – this time a G.L. Watson design rather than by William Fife Jr. Sensible man. Sensible, not because he chose Watson over Fife (what a choice to have to make), but because this design represents the huge advancements in experience and knowledge of hull form that had taken place in just four years since the design date of Hubert’s earlier replica builds, the cute Seabirds and the spectacular Fyne, both drawn by William Fife Jr in 1889. No. 274a, we shall call her for now, benefits from the fact that her design dates from the creation of “The Britannia Ideal“, a point of moderation in all aspects reached by Watson in 1893 that has never really been bettered since – only tweaked – in the design of moderate displacement, seakindly hulls. This replica, constructed in wood epoxy, is based on G.L. Watson & Co. design nos. 274 and 275, the fiddle bowed, gaff cutter identical twins, Gipsy and Brunette, originally built in 1893 by James Adam & Son, Gourock, for Paisley threadmaker extraordinaire, James Coats Jr. They were specifically intended for match racing among friends, including Watson himself (distantly related to Coats), and must have been considered successful enough to be followed off the drawing boards the next season by their very similar, but slightly longer cousin, Peggy Bawn (design no. 317), built for Belfast cotton merchant, Alfred Lepper, by the prolific Carrickfergus boatbuilder, John Hilditch. Knowing what a dream Peggy Bawn is to sail, we can have confidence that this as yet unnamed cutter will give her Singapore-based owner endless pleasure, and turn heads along the way. Construction images, and a glimpse of another Watson replica, Red, in build more traditionally (more on her soon), can be seen at the G.L. Watson & Co. Ltd website here. What became of the originals?. Brunette between the wars; possibly in the Kyles of Bute? 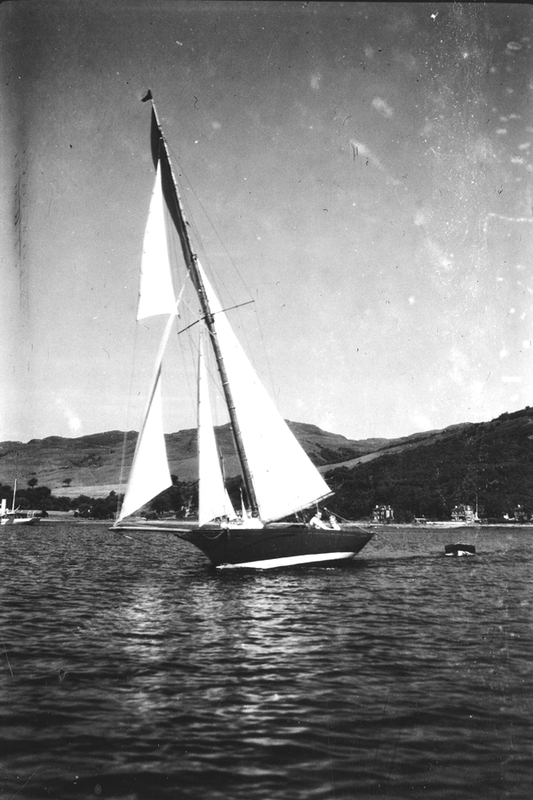 James Coats Jr parted company with Gipsy in 1899 in the nicest possible way, giving her to his long time skipper, Robert Duncan, who lived nearby to the site of her birth at Gourock. She remained with the Duncan family until broken up c.1934. On Coats’s death in 1912, Brunette was one of six yachts – all G.L. 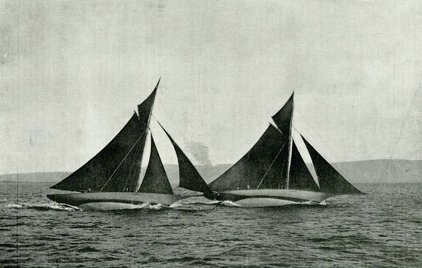 Watson designs – still under his ownership, ranging from the 3 ton, 24ft lwl cutter, Sprite, through Brunette to his famous 1883 racing cutter Marjorie (72 tons), her steam tender/tug Iris (68 tons), and the steam yacht Triton (337 tons, now Madiz) which was tender/tug to his magnificent 1899 schooner Gleniffer (496 tons). According to one obituary, none of this magnificent fleet had slipped its mooring for many years, but they were commissioned each spring with upwards of 70 crew always ready. Brunette had a long subsequent life out to grass as a Clyde cruiser, based for a period at Cardwell Bay, Gourock; possibly latterly at Rhu – perhaps into the early 1970s. Does anyone remember her? 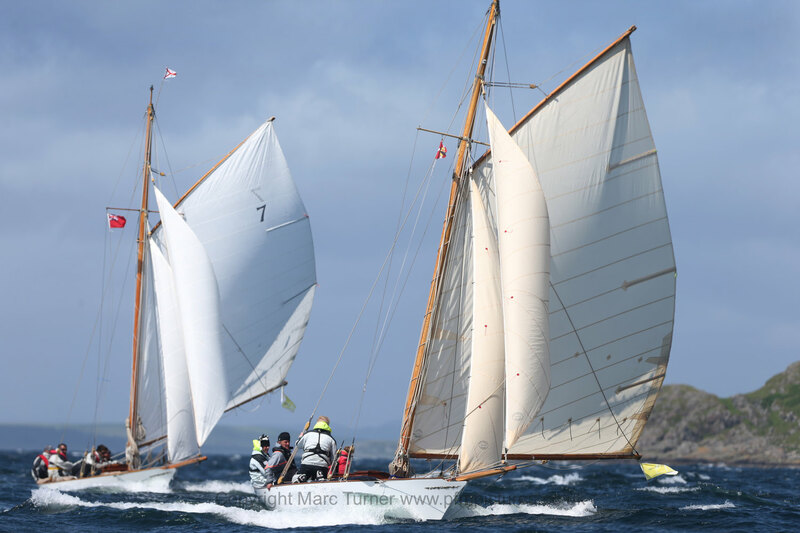 The French boats, Fiona and Seabird, joined the locally-based Oblio for the unofficial “World Championship” of the Hubert Stagnol built Seabird Class during last year’s Fife Regatta on the Firth of Clyde. After a keenly contested Auld Alliance ding-dong sailed in the usual mix of Scottish weather, it was Didier Cotton’s Fiona that came out on top by just one point from Gordon Turner’s Oblio. But it might have been a different story: the local crew was so mustard keen to uphold Scotland’s honour that they were over the line early at the start of two out of the five races sailed. 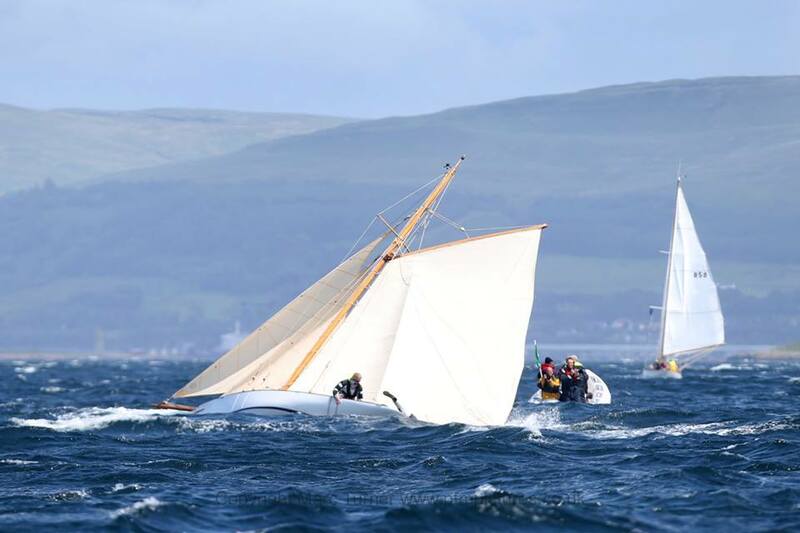 A great example of how hard they tried to make amends was caught by photographer, Marc Turner, as they prepared to gybe – the only Class III boat to attempt it – off Garroch Head, Isle of Bute, during the rather breezy race from Portavadie to Largs. Various suggestions were proposed for the activities of the person attached to the sea boot. Martin Black’s biography G.L. Watson – The Art and Science of Yacht Design can be purchased online here, or at the worldwide stockists listed here. * The company Watson started in 1873 continued after his death under the direction of J.R. Barnett and his successors, and exists today as G.L. Watson & Co. Ltd., based in Liverpool, complete with the 140+ years archive of drawings, data and images. This entry was posted in boatbuilders, boatyards, Britannia, Captains, Clyde yachting, Firth of Clyde, G.L. Watson, G.L. Watson & Co., G.L. Watson & Co. Ltd., G.L. Watson clients, Irish yachting, naval architect, object of desire, The Weekend Watson, yacht design, yacht racing, yachting history and tagged Britannia Ideal, Brunette, Fife Regatta, Gipsy, Hubert Stagnol, James Adam Gourock, James Coats Jr, John Hilditch, match racing, match racing history, Peggy Bawn, Robert Duncan, Seabird, seakindly, William Fife Jr. Bookmark the permalink.